Maintaining mental performance requires the optimal functioning of brain cells and the complex neuronal network. Brain cells cannot be replaced and have the highest priority in the body for micronutrients. 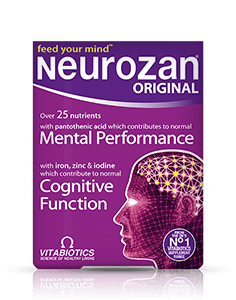 Neurozan provides a comprehensive formula and has been developed to help safeguard your dietary intake of essential nutrients for all round health and vitality along with important nutrients such as iron, zinc and iodine to help contribute to normal cognitive function. Neurozan is recommended for both men and women of all ages and is also ideal for those studying for exams or professional qualifications, especially during examination periods. Generally, Neurozan may be used alongside medications because it contains only moderate levels of vitamins and minerals, and is free from any drugs and hormones. For specific advice on taking Neurozan with medicines, we recommend that you contact your doctor or pharmacist first. 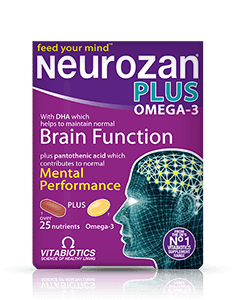 Neurozan contains 30 tablets and it is recommended to take one tablet per day. One tablet per day is recommended with or immediately after your main meal, with water or cold drink. Neurozan tablets should not be chewed. Neurozan should only be taken on a full stomach. Taking the tablet with a large meal maximises the absorption of the nutrients, and can reduce nausea, which is sometimes experienced if multivitamins are taken on an empty stomach. Always ensure that Neurozan is taken with plenty of liquid to wash the tablet down. Neurozan has no known side-effects when taken as directed. Do not exceed the recommended tablet intake. In case of overdose, seek medical advice immediately. Results vary amongst individuals, but in most cases, we would expect the beneficial effects of specialist nutrients in Neurozan to build over several weeks. There is no maximum length of time over which Neurozan may be used. A regular intake is recommended.